If you are considering a trip to Cambodia, first of all good for you! 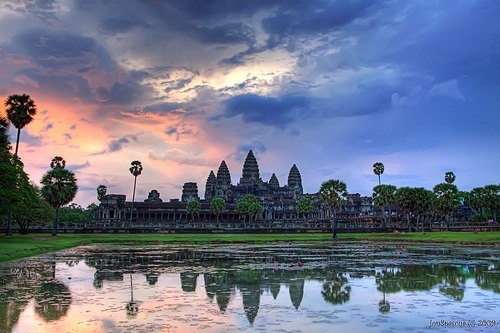 And second, you probably have heard of Angkor Wat, or Angkor Vat, a Khmer temple. If not, look up Cambodia and you will find a picture of it, as it is probably the most known sight to those outside of Cambodia. So what exactly is Angkor Wat? The area is more of a park than just one temple, so there is much to see. The greater area has recently been saved from the crowding of the jungle and much more has been discovered than was previously thought was there. To get in and around, you need a pass, and they will check. These passes are: for 1 day, three days, or for 7 days. The 3-day pass is good for 3 entries in a given week, and the 7-day pass is good for a month. You can also hire guides for varying amounts to lead you around. Plan to spend a lot of time here, there is so much to see, from statues of the Buddha and carvings of Avalokitesvara. Angkor Wat is a combination of Hinduism and Buddhism; the main temple started out devoted to Shiva in Hinduism and now most of the area has been converted to Buddhism. This is a place with deep spiritual roots and so you should dress respectfully and treat the area as sacred. Show up early for a phenomenal view of the sunrise and come back midday to miss the crowds and tour buses, it opens at 5 am; you will see many devout people at this time, honoring their religion. The sunset is even more spectacular, climb up to the top tier to watch it and feel the peace descend. A note: Women, do not go to watch the sunset alone, or be alone when it gets dark as violent acts towards women have grown in Cambodia. Everyone remember to get your malaria medicine before going to Cambodia. 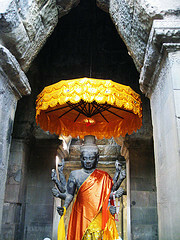 Angkor Wat is located 20 minutes by car or motorcycle north of central Siem Reap. Last updated by Tracy Huddlestun on 03 November, 2013 in Destinations.